Wednesday December 18th 1894 I was busy with the work all forenoon. Ida did not feel at all well but helped Nellie with her lessons. I sewed and we talked in the afternoon. Charlie came out with Will in the evening to stay all night. We read and talked in the evening. weather very nice. Thursday December 20th 1894 I did the work and had an early dinner. Will took us all down town where we got a few little things for Christmas and went on over home. he took time to go over to Woolfs to see how Will was. It was nearly eight when we came home. Charlie came with us. We spent the evening talking. It was a pleasant winter day. Friday December 21st 1894 Will went in town and was gone all day. I was busy with the kitchen work all forenoon. I cooked chicken for dinner and had cleaning done. Ida was busy with Nellies lessons.I sewed all of afternoon and talked with Ida. Charlie came home with Will. We all hands talked till nearly mid-night. A fine day. 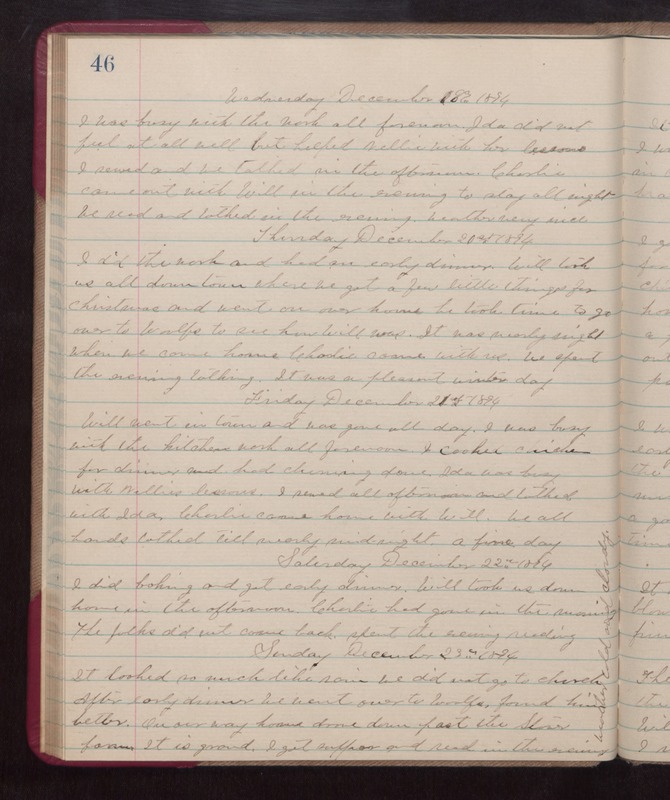 Saturday December 22nd 1894 I did baking and got early dinner. Will took us down home in the afternoon. Charlie had gone in the morning. The folks did not come back. Spent the evening reading. Sunday December 23rd 1894 It looked so much like rain we did not go to church. After early dinner we went over to Woolfs, found him better. On our way home drove down past the Stowe farm. It is grand. I got supper and read in the evening. weather cold and cloudy.